The Monarchy of the United Kingdom is the head of state of United Kingdom. The current monarch is Elizabeth II who has reigned since 1952. 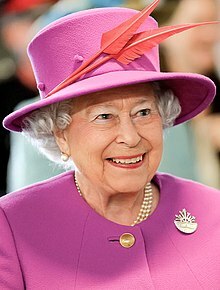 The queen is currently the head of the U.K and 15 other nations known as the commonwealth realms. In 1917 King George V changed the royal household's name to Windsor because the United Kingdom was at war with Germany and Saxe-Coburg-Gotha is a German name. The house had officially ended in 1910 upon the death of Edward VII. In 1921 Ireland was split into the Republic of Ireland and Northern Ireland. Northern Ireland stayed part of the United Kingdom. However, the name was not changed until 6 years later. This page was last changed on 15 March 2019, at 18:15.